Michael Torchia, Health and Wellness Expert is guest appearing on the NBC TODAY SHOW, April 11th, 2008 at 8:00 am, to debut his fitness program for animals. He will be working with “Taylor,” a 10 year old overweight golden retriever with severe arthritis and “Abbey,” a blind 4 year old obese rotweiller. Torchia will have both dogs doing exercises outside in a park and then in the studio utilizing a treadmill. Torchia will be traveling across the country helping people in need to create healthier lifestyles for their pets. 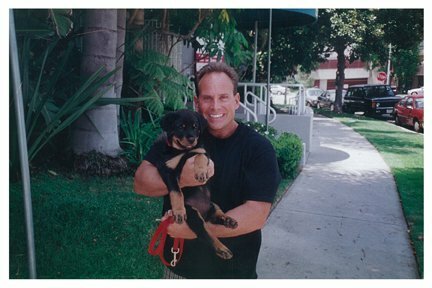 His mission is to take people who have typical excuses of why they can’t make time to give their pets exercise and help them eat right, helping them make the necessary changes in their lives to permanently maintain a healthier way of living for their pets. A habit is something we do without thinking about. Studies have shown us that our normal behavior is based on our habits. That means how we spend our money, what we watch on TV, what we eat and how we take care of our pets. 90% of the time we are on autopilot. We’re on the phone or texting while we’re walking our dog or feeding the cat, so they don’t get the care and attention they deserve. So if you need to create a healthy lifestyle for both you and your pet, you need to identify your bad habits and then start to make changes. It’s easy not to take your dog for a run or long walk and let them eat anything they want, but you have to give up some of your time to keep them healthy and happy. It will be uncomfortable and a struggle at times, but they will become healthier and happier pets because of it. As an animal lover, he’s deeply concerned with our overweight pets, so he started “Healthy Pet Nation.” In America, just like humans, obesity is a common problem for dogs and cats. There are 175 million companion animal owners who often treat their pets as ‘children’ and spoil their furry friends. These owners need to have “Riley” and “Princess” follow a total weight management program that will result in controlled weight loss and maintenance. Torchia and his team will educate communities nationwide on how they can help prevent and alleviate pet obesity. They will go into homes to assess the daily environment and help people implement a well-structured wellness program for their dogs and cats. This program will include evaluating the animal, educating the pet owner, modifying behaviors, and tailoring the program to each animal.